Bracelets! I've always been really into stacking my bracelets but only really do it in the Summer time. I literally bought these about a week before the end of May so I could've waited and included them in June's favourites but I'm impatient. The left picture are all the bracelets I've been wearing together. The really skinny ones are 2 different sets from H&M. 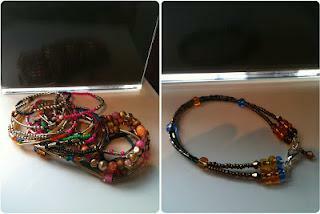 One set is gold/bronze/black and white beads and the other set are gold/colourful beads. The chunkier bracelets are from Miss Selfridge about 3 years ago and they are still going strong! The bracelet on it's own in the right hand picture is from Javien. Javien is a small jewellery and accessorary business run by my Mum and Auntie. I did a full blog on it here. 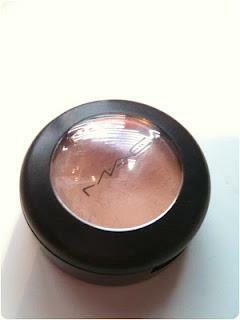 MAC Paint Pot - Painterly: This product is incredible! It's brilliant. It can be used on most skin tones as an eye base or on it's own. When I'm going for the natural look, I use this first then put a very pale skin tonesdeye shadow over the top such as MAC's Brule, just to get a smoother effect on my eyelid. I've used this every day since I bought it and it still hasn't got a dip in it yet! I love this stuff and I definitely want to buy more in different colours. 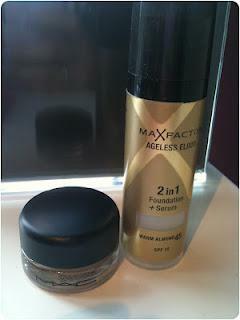 Max Factor Agelesss Elixir 2in1 Foundation: I recently did a full blog post review on this product which i'll link here but basically it's a brilliant foundation for dry skin as it has serum in it. It lasts all day and give's a lovely flawless finish. I've been using this for a couple of months now and I still love it. OPI Spark De Triomphe: Not only is that the cutest word play name for a nail polish, it's a stunning glitter packed polish too! With just one coat it looks lovely but with 3 it's unstoppable! I wore this non-stop for about 2 weeks. I love it so much! Ciate Purple Sherbet: This is technically a June favorite as I got this June 1st but after having a long weekend and 4 days off work, I've lost track of the days. Whoops. Anyway, it's lovely. I've had it on about 4 days now and it's only just started to chip. 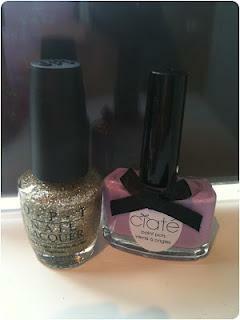 It's lovely and I'll be buying more polishes from Ciate in the future. 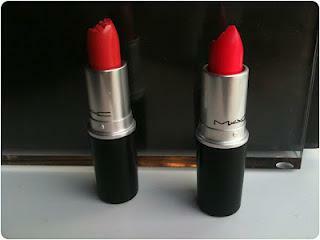 MAC lipstick's: Crosswires left and Impassioned on the right. These lil babies are wonderful! They are so pigmented and last for ages. Especially impassioned. It actually stains my lips with the vibrant pink color which I love! I did a post on it here. I'll be doing a crosswires post soon too! The picture doesn't do the colours justice but I promise you, they are gorgeous. I never used to wear lipstick. I always reached for lipbalm, but every morning since I got these two, I've put the effort in and put it on. MAC are my new favorite lipsticks, by far! MAC Studio Finish Concealer: This isn't in the main picture at the top as it was in my make-up bag and I forgot about it. Silly girl that I am. Like the rest of my products this month, this is amazing! I bought this a couple of weeks back when I got the other MAC items mentioned above and I really don't know how I lived before this concealer! It's quite thick and as my skin is always red and covered in flare-ups, this is perfect as it covers it all perfectly. The one tiny problem is that when I get hot, it runs a little, but that's nothing a little powder can't fix! MAC 224 Blending brush: I only had one fluffy brush which I use for my crease, so I needed another one that would be cleaner to do my blending. I got this on my 35% off MAC day after my course finished, along with the rest of the MAC from this post, and it's really good. It's soft and does the job perfectly. Will definitely be buying another one to add to my professional kit. Real Techniques detailer brush: I'll admit, when I first bought the Real Techniques core collection, I wondered what I was going to use this brush for. It just sat in my brush holder gathering dust. During my course, the teacher used a small brush similar to this one for putting concealer on blemishes and for correcting lips shapes when doing a bold colour, so then I used it for that one day, and now I'd be lost without it. 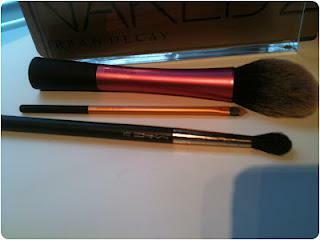 Without a doubt, I'm adding all the Real Technique brushes to mine and my professional kits. They are brilliant. Real Techniques blusher brush: It seems that every month now I have at least one Real Techniques brush included which I'm definitely not moaning about. This brush is super soft, as are all the other's from the line. This brush in particular is a big favorite of mine as it applies blusher so effortlessly and always looks incredibly blended. The dome shaped brush really help the bristles just glide over the cheekbones and therefore, your blusher always looks incredible! So there's my beauty favourites. Now onto my random. 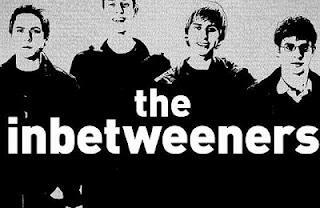 Inbetweeners: I used to hate this programme. I would refuse to watch or talk about it because it was so rude and had a lot of swearing in it, but I've finally realized I'm not an 80 year old women and when my new boyfriend suggested we watch it, I agreed. We then watched all 3 series and the film in 3 days. I LOVE it! It's hilarious. Yes it's still the rudest most vulgar programme on TV, but it has me in stitches. I'm actually going to start again from the beginning. 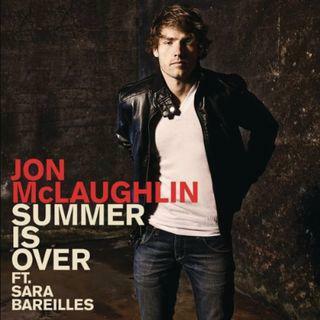 Jon McLaughlin - Summer is over (ft. Sara Barilles): This song is lovely! Whenever I listen to it, I always picture myself on a roadtrip in America, with the roof down and the wind in my hair.....enough said. It's a lovely song. I am yet to buy his new album, Promising Promises and I'm losing patience...might have to make a sneaky purchase. If any of you don't know, he sang So close in the film Enchanted, and just look at him?! I recently watched him on a live web feed in America and he was Incredible! His singing live was awesome and his piano skills! I have never seen or heard such amazing piano playing! I recommend a listen to Summer is over, So close, Human and Beautiful Disaster. Bethany - Macbarbie07: A lovely cute YouTube guru. Her videos are really good and to the point. She's awesome at hair tutorial's and all her videos are really quirky. I love watching her videos and always get inspired to try out the looks she's just shown. 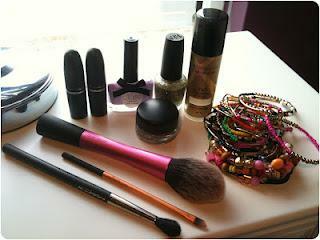 Her YouTube channel is: Macbarbie07. So that's it for my May favourites. I hope you enjoyed reading this. I think I've decided to stop YouTube videos now. As much as I love to make them and edit them, I just don't have the time at all, but I'll definitely be carrying on my blogging.